Denis Urubko working hard as he passes Pastukhov Rocks at 15,420 feet. Himalayan veteran Denis Urubko dominated this year’s race up Europe’s highest mountain, 18,513-foot Mt. Elbrus in the Russian Caucasus Range. Urubko ran and power-hiked more than 10,600 vertical feet from the Azau cable-car station to the western summit of Elbrus in 3 hours 56 minutes, almost 40 minutes ahead of the next finisher. That’s more than 2,600 vertical feet an hour—try that on your Stairmaster! Urubko, a Russian native now living in Kazakhstan, is a past winner of the occasional speed-climbing competitions on 22,950-foot Khan Tengri in the Tien-Shan Range. He has climbed ten 8,000-meter peaks, including new routes on Broad Peak and Manaslu in the past two years, both climbed alpine-style with a single partner. The Kazakh climbers Andrey Puchinin and Svetlana Sharipova were the fastest man and woman on a shorter course on Elbrus, starting at 12,165 feet. Puchinin covered 6,345 vertical feet in 2 hours 46 minutes, and Sharipova finished third overall on the short course in 3:21:29. 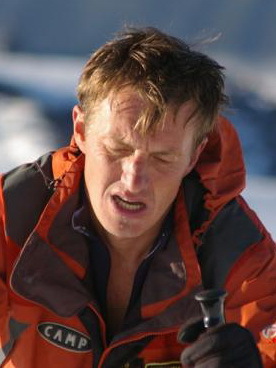 In April 2006, Austrian Christian Stangl claimed a record for the Elbrus ascent by running the same route from Azau, starting slightly lower, in 5 hours 5 minutes. It seems the record is now safely in Urubko’s gloved hands. The Elbrus races began in the Soviet era during training sessions for Himalayan expeditions. The full-length race was reintroduced last year. This year’s race drew 16 climbers from five Eastern European and Central Asian countries. The team of marshals , by which efforts ELBRUS RACE 2006 was done excellent!! Master of Sports Tatyana Timoshenko just returned from Uzunkol , where she worked as an instructor at the assembly - and then joined the staff of friendly judges . Tatiana once participated in a race on Mount Elbrus in picking female Himalayan team. Dmitry Drachyov and Alexey Gorbatenkov worked at last year's race : Drachyov on the saddle , Gorbatenkov - on top. Over the past 5 years, Alexei Gorbatenkova have done about 30 Elbrus climbs! The names of the sportsmen who have registered to take part in Elbrus Race (speed climbing) on September, 14 in this class are well known all over the world and the results of their achievements are given in the information resources (Internet sites, sports magazines, television programs), who publish materials about their unique physical opportunities and exceptional virtue. Denis Urubko (Almaty) is one of the strongest high mountaineers in Kazakhstan, a World class athlete, who has climbed the peaks of ten of 14 eight thousand meters high mountains of our planet, not using additional oxygen – Everest, Lkhotze, the Hidden Peak, Gasherbrum II (the speed climbing for 7 hours 30 minutes and the descent for 4 hours), Kanchendzhangu, Shisha Pangmu, Nanga Parbat, the Broad Peak (2 ascensions, one of which was made by the new route on the South-West wall in tandem in the Alpine style, this ascension was nominated for Golden Ice Axe as one of the best ascensions in 2005), Annapurnu, Manaslu (2 ascensions, one of which was made by the new route in tandem in the Alpine style in spring 2006). He has received the title of Snow Leopard (he fulfilled the program (i.e. climbed to 5 seven thousand meters high mountains) during one season). In 2000 he became the winner of the speed climbing to the peak of Khan Tengri (7010 m), it took him 7 hours 40 minutes to climb to the peak and together with the descent it took him 12 hours 21 minutes. He has become a winner in the speed climbing competitions to the peaks of Amangelda, Abay and Nursultan for many times.